Clearly, both the fictionalized and very real John Graves Simcoe narrowly avoided being put to death upon capture. And, as in the show, the ordeal for the real Simcoe was just beginning. 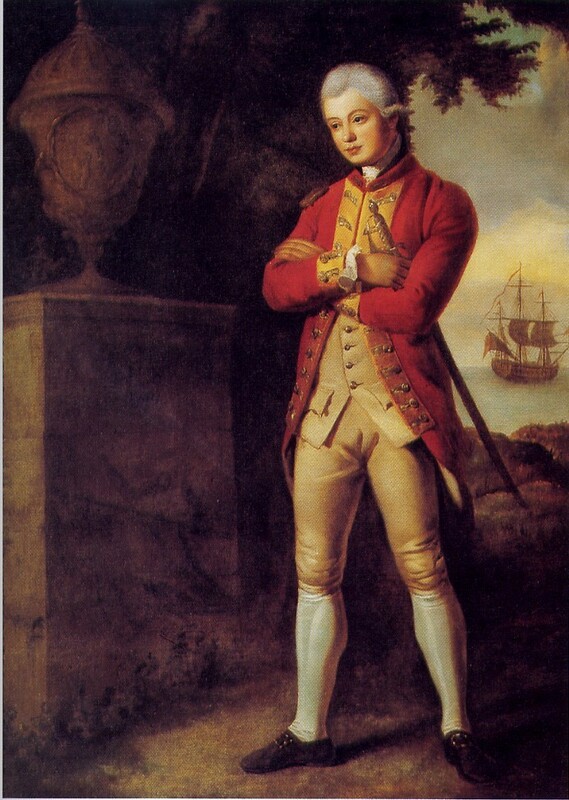 The REAL John Graves Simcoe as a young British officer, painted in 1770 by William Pars. Click to enlarge. For the first few days, Simcoe was reasonably well off. Confined in a tavern owned by a local militia colonel, he had his own room, and the surgeon of the regiment, as well as his servant and a soldier of the corps to assist him. (n.b. : As discussed in T. Cole Jones’ post on prisoner treatment in Revolutionary War, this was in keeping with standard POW treatment of officers.) That would soon change, however. Officers were generally not locked in cells by either army, but that is where the young lieutenant colonel now found himself. A loyalist militia officer, was chained to the floor of the jail and on a bread and water diet. Others in the jail included two recaptured British soldiers who had previously escaped from prison in Maryland and were allowed no food. Two other Loyalists were there to be tried for high treason, as well as a black man chained to the floor who was later condemned to death. Simcoe was definitely not in a good place. In conjunction with his pretended insanity, Simcoe kept up a letter-writing campaign to win his freedom, particularly with Governor Livingston, and eventually George Washington himself. It finally paid off. Within a few days of writing Washington, Simcoe was exchanged and by New Year’s Eve back on Staten Island: “Received at Richmond by the Regiment & Inhabitants with every demonstration of joy.” Simcoe was again a free man after a tumultuous captivity, and soon back in command of the Queen’s Rangers. As we can see, while the real Simcoe’s captivity deviates considerably from its portrayal on TURN, it still encompassed plenty of drama and life-threatening situations. Fact can trump fiction when given a chance. We shall see what new turmoils and tribulations await the TV Simcoe before he too, presumably, rejoins the British. This sounds much more dramatic than the TV show, and more interesting and in a way a bit comical with Simcoe pretending to be insane. Poor Captain Voorhies. Bad things certainly happened to officers of the 1st NJ Continental when they were on leave (several captures, including Capt. Longstreet, Lt. Costigan and Col. Ogden). but Voorhies is the only one I know of who was killed while rallying the militia, though Maj. Morris was mortally wounded at Whitemarsh while on detached service with Morgan’s Corps. Bravo! As a Canadian and descendant of Loyalists, I am quite interested in the character of John Graves Simcoe, 1st Lieutenant Governor of Upper Canada. I have just finished reading “Mrs. Simcoe’s Diary”, where JGS receives a certain kind of treatment from a wife/writer who was obviously very fond of him! I am grateful that he made it through the Revolutionary War to give so much to our country. The show TURN, while fictitious, can support the reality that the WAR gave birth to TWO countries, and is certainly a civil war. I wonder how a Canadian treatment of the spy culture outlined here would look like? Thanks for “TURN”ning the spotlight onto this most fascinating subject! All I can say is, the actor portraying Simcoe certainly comes across exactly as smarmy and arrogant and simperingly condescending as I’ve always imagined the occupying British did actually act. He makes every nerve in my body absolutely vibrate with the strong desire to administer a bullet to Simcoe’s brain as quickly as possible. It is wonderful portrayal by a master actor. Bravo!